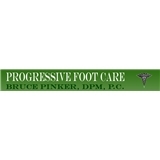 Bruce Pinker, DPM (Nanuet) - Book Appointment Online! Welcome to Progressive Foot Care’s website. With years of experience and offices in Westchester and Rockland counties, we are here to treat all your family’s foot care needs. We pride ourselves in making every patient’s office visit a pleasant experience. We are genuinely interested in hearing what our patients have to say. Simply put, we listen. We offer complete diagnostic foot evaluation for children, adults, diabetic patients, surgical candidates, and athletes. We are highly skilled and talented in foot surgery. The guy seems knowledgeable and friendly. The White Plains office needs a good cleaning. I really felt uncomfortable and honestly was very shocked a doctor’s office was so dirty. Then came the doctor. His lab coat was literally black and had stains all over it. He may be the best foot doctor in the world but his office and his personal hygiene turned me off so much I won’t be returning. He didn’t wash his hands before he touched my feet. Sorry, but that’s just not right.